The Multi Quick 3 hand blender gives you controllable and powerful blending with Powerbell Plus technology for extra milling blades and for less pre-cutting and 2 speed control for single handed use. 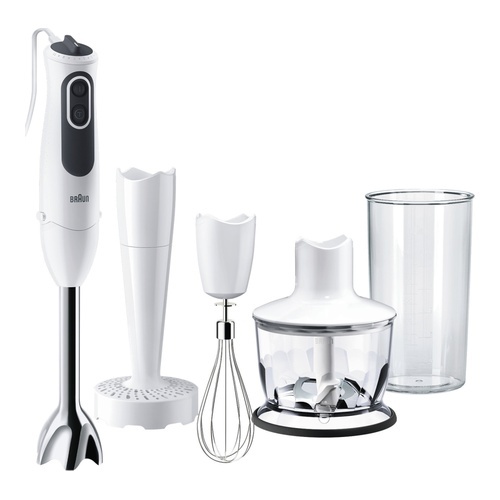 The Multi Quick 3 hand blender blends whole foods in seconds, and the anti-splash design ensures a spotless kitchen. Along with the hand blender, you get a 600 ml BPA-free plastic beaker with ml and fl oz measurements, a whisk, a Purée/masher accessory and a chopper to chop meat, hard cheese, nuts, herbs and carrots in seconds. The Multi Quick 3 hand blender gives you controllable and powerful blending with Powerbell Plus technology and 2 speed control. It comes with a 600 ml BPA-free beaker, a whisk, a Purée/masher accessory and a chopper.